Hailing from the historic Italian city of Bologna, home to the oldest university in the world, Accordo dei Contrari (Italian for “Agreement of the Opposites”) started out their career in as a trio; then, after a number of line-up changes, recorded their debut album, Kinesis (released in 2007) as a quartet. The same line-up is featured on Kublai, their sophomore effort, released in the spring of 2011 – an album that is sure to put them on the map of even the most demanding lovers of progressive rock. Sadly, the band was one of the “innocent victims”, so to speak, of the unfortunate cancellation of the 2011 edition of NEARfest, which deprived American prog fans of the opportunity to witness a number of exciting modern bands. While the album’s title may bring to mind the fabled character of the Mongolian emperor celebrated by the likes of Marco Polo and S.T. Coleridge, in this case the name Kublai is meant to represent “the most distant point in an imaginary landscape. It represents ordered chaos, light and dark, the balance between written and improvised music.” A clear statement of intent that accurately sums up the musical content of Accordo dei Contrari’s second album. With its stylishly minimalistic cover artwork, Kublai is a supremely classy package that shows a band whose compositional and instrumental mastery is growing by leaps and bounds. Running at a compact, perfectly balanced 45 minutes, the album sounds fresh and original even when the band’s main sources of inspiration are referenced. While Accordo dei Contrari do not choose to employ as extensive an array of instruments as other modern bands, they manage to create an impressive volume of sound with a rather restrained instrumentation, dispensing with the violin and saxophone featured on their debut, and therefore perfecting the “electric quartet” format. For an album that might be tagged as jazz-rock, Kublai seems to revolve a lot around Giovanni Parmeggiani’s stunning keyboard work. Indeed, the keyboards are definitely the driving force of the disc, with the distinctive rumble of the Hammond organ lending a touch of unbridled hard rock passion to the overall sound: there are moments on Kublai in which Parmeggiani sounds as if he was channeling Jon Lord. Opener “G.B. Evidence”, a variation on a Thelonious Monk composition, immediately introduces the listener to the fascinating world of Accordo dei Contrari, with Cristian Franci’s crisp, inventive drumming, bolstered by Daniele Piccinini’s sleek, versatile bass lines, sparring with Marco Marzo’s simmering guitar and Parmeggiani’s subtly layered keyboards. In the second half, guitar and organ engage in a sort of dialogue that conjures images of Deep Purple jamming with Mahavishnu Orchestra. Clocking in at 12 minutes “Arabesque” presents Accordo dei Contrari’s own twist on the obligatory prog ‘epic’, making effective use of a steady electronic drone to create a faintly ominous atmosphere underlying the stately beauty of the Eastern-flavoured acoustic guitar arpeggios in the first part of the track. The overall loose, somewhat rarefied texture, the flow of the music broken by frequent pauses and surges in volume, occasionally gains intensity in bursts of energy that bring to mind the revolutionary sonic melting pot of Area circa Arbeit Macht Frei. Bookended by sonorous gong. “Dark Magus” (a nod to Miles Davis’ 1974 album of the same title) reinforces the impression of classic jazz rock coupled with the intensity of vintage hard rock. Parmeggiani attacks his Hammond with unadulterated abandon, while Franci’s stellar drumming propels the whole of the composition along, with Marco Marzo’s guitar in an invaluable supporting role. Strategically placed at the opening of the album’s second half, “L’Ombra di un Sogno (Shadow of a Dream)” is the only track with vocals, provided by none other than the ‘voice of Canterbury’, Richard Sinclair, who also wrote the gentle, moving lyrics in memory of his dog. Centred around Sinclair’s subdued yet emotional interpretation, his velvety baritone bending the music to its will, the song – somewhat sparse at first, with a hauntingly insistent guitar line, then taking a jazzier turn towards the end – brings the the sound of iconic Canterbury bands such as Hatfield and the North and National Health into the 21st century. On the other hand, “Piu’ Limpida e Chiara di Ogni Espressione Vissuta, Pt. 1” steers towards a more symphonic direction, with organ and guitar alternating in the lead role, and an overall solemn, meditative feel even when the pace picks up. The album ends with the “Battery Park” (inspired by a windy, sunny February day by the Hudson River in New York City), a lovely, piano-led piece based around a main theme developed in a stop-start movement, the various sections climaxing and then subsiding like the natural flow of a water course. 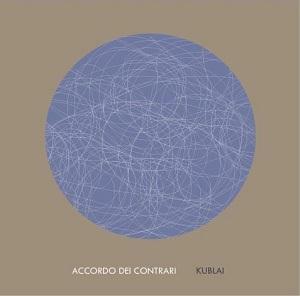 A perfect marriage of formal elegance and emotion, rich with diverse influences but always cohesive, Kublai clearly proves that Accordo dei Contrari are ready to take their rightful place alongside D.F.A. as purveyors of impeccably executed, yet warm and emotional jazz-rock in which keyboards play a prominent role. The band have amply fulfilled the promise shown by their debut, Kinesis, and the compositional and technical maturity shown on their sophomore effort bodes extremely well for their future career. A must for fans of the Canterbury scene and classic jazz-rock in general, Kublai will delight anyone who loves great music – whatever the label attached to it.